This is Part 2 in a four part series examining the importance of proper auxiliary percussion in large ensemble performance. The instruments suggested are a basic inventory recommended for all band programs. Within the world of percussion instruments, this inventory can be augmented to accommodate a wide variety of works for band. In this part of this series, we will take a look at another set of basic auxiliary instruments, that band director should have for their ensemble. The instruments we will look at now are: Wood Block, Temple Blocks, Vibra-Slap, Claves, and Slapstick. Wood Blocks a made in a variety of sizes. Usually, the player will get maximum resonance when they hold the wood block in their hand while performing. Wood blocks can also be played suspended or laid on a well-padded table. Latin Percussion, Grover Pro Percussion, and Ludwig make very good quality wood blocks. Latin Percussion blocks offer mounting capabilities when used with a special mounting clip. For a more universal mounting, the Grover blocks are mountable on a cymbal stand, L-rod or a multiple percussion rack. Although a wide variety of mallets can be used to play the wood block, hard rubber mallets will give the most characteristic sound from the instrument. Temple Blocks are usually sold in a set of five different pitches. In comparison to wood blocks, temple blocks offer a more deep, mellow sound. Traditional temple blocks, such as Ludwig or Blocks, are made out of wood to give a very deep sound. However, more recent developments in synthetic material have produced studier versions of temple blocks with a more natural sound. Latin Percussion and Ludwig offer synthetic temple blocks with the durability many directors want from their equipment. The modern day version of the quijada is the vibra-slap. The quijada was simply a jawbone of an animal, usually a cow, that when struck would produce a rattling sound from the animal teeth vibrating in the jawbone. Latin Percussion developed a durable, modern version of the quijada, which offers the closest sound to the original instrument. By striking the ball of the instrument, the rattling sound is created from small metal rods vibrating against the walls of a wedge-shaped chamber. Claves are a distinct auxiliary instrument heard in many styles of music. Claves are two large wooden rods that produce a distinct clicking sound when they strike each other. Rosewood claves offer a very characteristic sound, although many other materials can be used. Ludwig and Latin Percussion offer traditional wood claves. 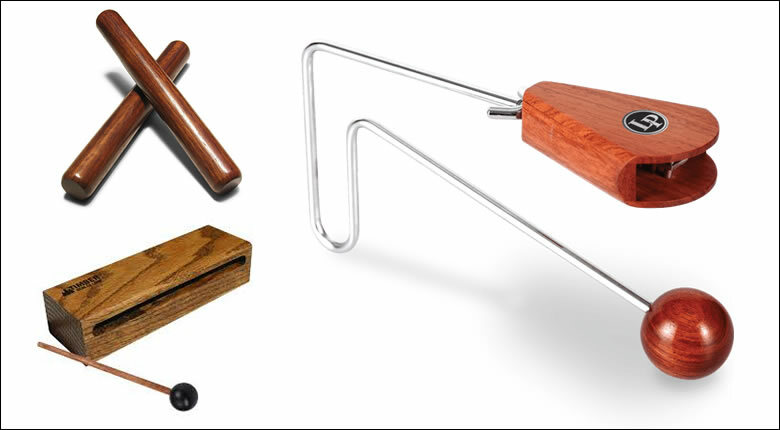 Rhythm Tech and Latin Percussion offer synthetic, unbreakable claves, which have a very classic sound similar to wood. There are many styles of slapsticks available which all accomplish the same desired effect. The two basic designs are a regular hinge style or the spring hinge style. Regular hinge style slapsticks are easy to play with the player striking the two wood sides of the instrument manually. The spring style is played with more of a whip-style motion to make the free moving side of the slapstick strike the handle side. For some, the spring style hinge takes a little more practice to play. Yamaha offers well-made regular hinge style slapstick. Toca, Ludwig and Blocks Percussion manufacture quality spring style slapsticks.